How was Balancing the Sword used at the University of South Florida? How was BTS used at USF? Question: I am homeschooling my 17-year old. We're going through the Old Testament right now, and I just stumbled upon a review of your book. I was wondering if you still have a copy of the course syllabus? I would love to see how you used the books for a college level course---what the pacing looked liked, and what writing assignments accompanied it. Perhaps I might be able to incorporate your book into what we are doing. Our focus this year as we read through the Old Testament is really on "understanding and knowing" the Lord, specifically going through His Word to see how He exercises "lovingkindness, judgment, and righteousness" (Jer. 9:24). 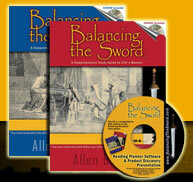 Answer: Thank you for your interest in the Balancing the Sword study curriculum. Although I do not have all of the syllabi, click to view one sample syllabus for Fall 1995. My USF students earned four credits on a senior level over the fifteen-week semesters during the spring and the fall and over the six-week semester during the summer. The three semesters rendered a total of twelve credits under the title of "Rapid Reading of the Scriptures" as classical literature. Students were required to do all reading in the Authorized King James Version. The Authorized translation was required because of its unsurpassed literary impact upon the English-speaking world. The KJV's reading difficulty added to the course's challenge, but students were welcome to also read a second or third translation to assist their understanding. Students read all sixty-six books of the Old and New Testament over the year answering the Balancing the Sword questions as they progressed. to encourage a love for the written Word and the Word who became flesh. Each week students demonstrated their comprehension through class discussions and quizzes. Questions for the weekly quizzes were always taken directly from the Balancing the Sword questions covered in the previous week; therefore, students were never surprised by a quiz's contents. However, only ten questions were used, and the students did not know which ten questions would be chosen. Each question was worth ten percent of the quiz's value. Thus, participants had to commit to memory a wide array of details. Finally, each student composed ten book reviews of one to two pages in length. Reviews had to capture a full and proportioned overview of the biblical book and include verse citations. As would be expected in the literature department, essays were rigorously graded for punctuation, grammar, spelling, vocabulary, and overall writing quality. The university appropriately required academic excellence in exchange for the credits. My foremost desire was to stir an excellence in love and living. I'm a firm believer that there is much in the Bible that may be called trivia, but there are no details that may be justly called trivial. The jot and tittle are important (Mt. 5:18). A Christian is to love God will all of his mind, in addition to loving God will all of his heart, soul, and strength (Mk. 12:30). One of the chief beauties of the Scripture is that it confounds the wisest Biblical scholars and is the milk for "newborn babes" (1Pe. 2:2). Stated in other words by Pope St. Gregory the Great about fifteen hundred years ago, "It [viz., the Bible] is, as it were, a kind of river, if I may so liken it, which is both shallow and deep, wherein both the lamb may find a footing and the elephant float at large." The difficulty which we require of ourselves or those whom we train can easily be scaled up or down to accommodate the starting position of the Bible student. The reading pace can be diminished and an easier translation can be used to make learning more attainable to the young. The more advanced can add the obligation of looking up some or all the cross references to add depth. You can create an itinerary in minutes using the BTS Reading Planner ® software which comes with the books.